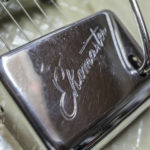 Chitarra Eko EKOMASTER 400, marchio italiano, in buono stato. Completamente originale in tutte le parti, elettronica compresa. 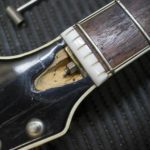 Truss rod perfettamente funzionante. Questo modello è stato ottimamente descritto da Fetish Guitars. 14 inch double cutaway, Fender Jaguar shaped solidbody with bolt-on neck, pearl vinyl top and neck. Black finished back. Raised Eko logo on upper bass bout. 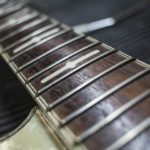 Nut: 1,7 inch (43 mm); 12th fret: 2,1 inch (43 mm). 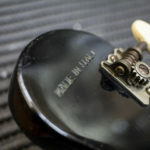 Blackfaced headstock with black, bell-shaped truss rod cover, “Made in Italy” printed on back. Open metal Eko tuners with white plastic knobs. 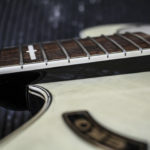 4-Ply binding around top, single binding around fingerboard and headstock. 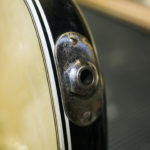 Small nickel Eko-type tailpiece plate. 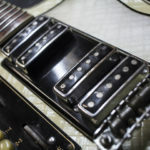 Two black faced single coil Eko pickups with blank metal poles on black plastic base plate. 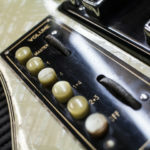 Two large metal volume and tone wheel knobs, and four white plastic pickup selector switches (1+2, Bass, Treble, Off) on black base plate above pickups. 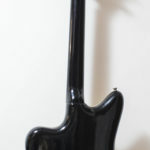 Transparent, ribbled plastic pickguard with black binding.